Butterfly Gold was released as a PYREX Compatibles pattern for the Correlle Dinner Ware pattern of the same name. Butterfly Gold was released twice; once in 1972 and an altered version in 1979. The two-quart Round Casserole in Butterfly Gold never appeared in any dealer catalogs. Some pieces in the Butterfly Gold pattern may found with both imperial and metric measurements listed on the backstamp. Butterfly Gold, designed by Gregory Mirow, was introduced in 1972 as a series of “Pyrex Compatibles.” Many new shapes and sizes with the Butterfly Gold pattern were launched during this time to complement the Corelle Dinnerware pattern released in 1970 of the same name. The Pyrex compatibles for Butterfly Gold can be found in two colors, both the orange tone that matches the Pyrex creation as well as a coordinating brown tone. Other such table accessories were released to supplement the ovenware such as napkin rings, drinking glasses, teacups, creamers, etc. After 1975 these accessories were grouped into a category called Tabletop Ware. Tableware became one of Corning’s biggest hits and was released in patterns of Winter Frost White, Spring Blossom Green, Snowflake Blue, as well as Butterfly Gold. The Butterfly Gold pattern was released both in 1972 and again in 1979 with an altered design. 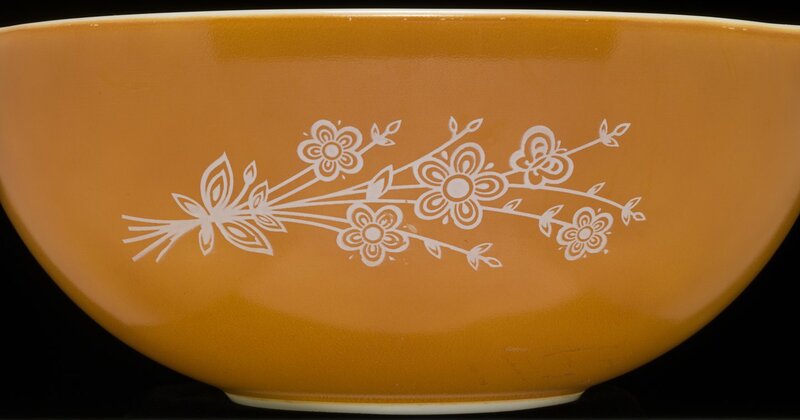 The original pattern was one large central flower flanked by a leaf, flower, and butterfly on each side on alternating white and orange bowls. The 1979 pattern portrayed a bouquet of smaller flowers on stems. This second pattern was only released as nesting bowl sets and 470/480 casseroles. While the Butterfly Gold pattern was discontinued in 1981 its Corelle counterpart went on for many years after. The 024 two quart round casserole was most likely released as a promotional item, as it does not appear in any dealer catalogs. In the early 1970s capacity listings on each dish were listed in imperial measurements, but by the late 1970s they were listed in metric units. As this was the height of production for Butterfly Gold some of the pieces may include capacity stamps in both imperial and metric measurements.